How far would you travel to a spa? As I begin to relax into my olive oil and honey facial the three-and-a-half hour flight from London to Greece seems to melt away as I reflect on my first day at one of Europe’s most exciting new spa resorts. 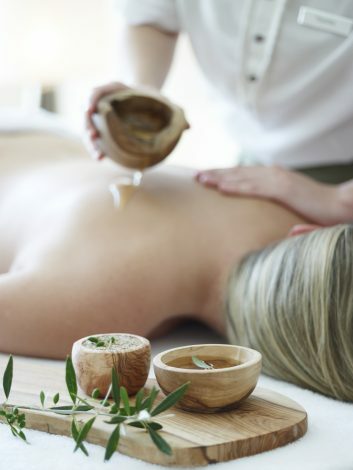 Costa Navarino, in Messinia, is exactly what spa travelling is designed for; it offers Anazoe Spa which is a marble palace complimented with indigenous spa products made from the surrounding olives harvested from the 6,000-tree estate and honey from their bees. These ingredients are mixed into traditional potions from age-old recipes preserved on clay tablets discovered in the nearby Palace of Nestor. What more could you ask for from a spa holiday? The aptly-named Sandcastle kids club offers youngsters (aged 4-12) the chance to bed down for the night – music to the ears of weary parents who can book the Selene Moonlight Massage which begins at sunset and continues until the moon rises all from the comfort of a private seafront sanctuary. This is the first spa resort I have visited that offers such a tempting treat for parents. The 4,000-square metre spa, which nestles in a herb garden, boasts 21-treatment rooms and three hot pools and thalassotherapy pools which beckon you in with the sound of bubbling water. The sound of modes and scales welcomes you into this haven and was specially-written by the composer who wrote the music for the Athens Olympics. Before my treatment I started to relax in the high density salt-water pool and the two thalassotherapy warm pools with hydrotherapy jets which stimulated and toned my aching muscles. The high concentration of salt in the water of various temperatures helps to deeply nourish and hydrate my skin. The refreshing and soothing facial utilises the ingredients of lime blossom, sage and olive leaf – leaving a healthy glow to my skin. The treatment included a hydrating ampoule treatment followed by facial massage and hand a foot treatment. Olive oil and honey, softens my skin without the abrasive effect some more “results driven” products do. This soothing combination would be ideal for sun burn if you happen to catch the rays while mountain biking or playing golf which are two activities offered on this extensive resort. The locally-inspired Messinian salt and honey Scrub is a luscious honey-based scrub using honey harvested from the bees on the resort and fused with healing oils and herbal essences and leaves you feeling quite literally like the Queen Bee! And the finishing touch was the Healing Massage Remedy by Hippocrates which draws on the ancient healing art of physiotherapy with Greek aromatherapy which left me feeling invigorated and renewed. Rediscovering your zest for life is what Costa Navarino is all about as there is so much to see and do once you have rested. After experiencing a facial and body scrub using products sourced from ancient tablets it should have come as no surprise to discover the ruins of one of the first ever hammams only an hour’s drive away at the medieval castle of Methoni which dates back to the 13th Century. En-route back to the resort from this impressive sea fortress it was time to kick back with a visit to the breath-taking ox-bow beach, Voidokilia, voted one of the best beaches in the world by The Times. It is almost a complete circle with a small inlet and doesn’t disappoint with its white, soft sand dunes and gentle lapping waves of the Ionian Sea. The peace and quiet of this resort is protected by a no motorised sports rule, but you can sign up to a session of Stand up Paddleboarding yoga. No wonder the shipping magnate and founder of Costa Navarino, Captain Vassilis, wanted to give a little bit back to the land of his birth. His vision for an eco-friendly resort in this region of Greece has taken 25 years to come to fruition, and despite his death in 2011 his work continues by his son Achilles, and today it is establishing its place on the global tourism map. The spa lies at the heart of the resort connecting the more rustic 445-bed Westin hotel with the marble-clad Romanos which boasts 321 rooms. As the resort is so extensive, golf buggies buzz around allowing you easy access to the golf courses and cafes and restaurants dotted around the Agora (meeting place). One highlight away from the spa was a Philosophy Walk with a debate on a sound mind in a sound body. We then sat in van Gogh-type chairs in the shade of the olive trees to contemplate life which is a luxury in itself. 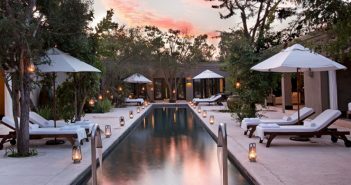 This is a resort which places nature and their local culture top of the list – so if you’re looking for an authentic spa destination this is the perfect retreat. It’s always a pleasure to visit one of our award-winning spas and Costa Navarino confirmed that our discerning readers know a good spa when they see. easyJet now flies to Kalamata. Flight time three-and-a-half hours from London Gatwick and about a 40-minute car transfer. Return flights from £130 per person. The olive harvest runs from August/September. Check out the eco-gallery an amazing museum of natural history images. Solar panels provide all the resorts energy and boar holes collect the rain water which are used to on the two golf courses and surrounding greenery. Each tree produces 10 litres of olive oil – which is an incredible 60,000 bottles from the resort every year. You can now buy Navarino Icons products at Harrods and Marks and Spencer’s in the UK. The more adventurous can jump on a mountain bike and set off to view the stunning Kalamari Waterfall in the Gialova Lagoon (GPS devices are supplied).